Congrats to Jamie Worall, Danielle, and Madison the 3 winners of this giveaway! For our second installment of My Mum’s Threads we have brought together some of our favorite things: local boutique Koo De Ker, fashion blogger and mama to the darling Hanes, Cara Loren, and free clothes for our dear readers! 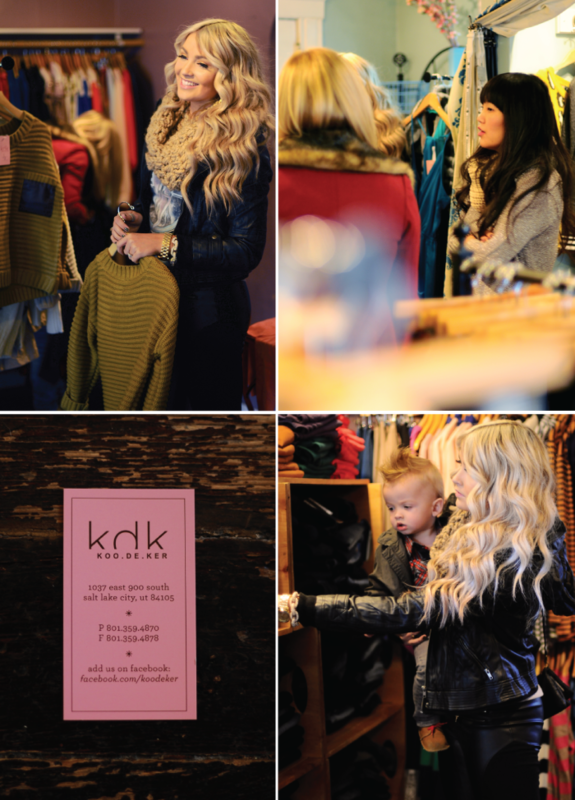 Koo De Ker had Cara and Small Fry over to shop their amazing new Fall line and put together mum approved ensembles. Cara hunted down the perfect pieces that suited her edgy style and would also keep up with any adventures she and Hanes encountered. Koo De Ker is the perfect combination of on-trend and well tailored clothing. Everything is brought in with the woman’s body in mind, their shop is chalk full of special and unique pieces, the kind that people will stop you in the street demanding to know where you got them. Here’s what Cara had to say about her Koo De Ker picks. Look No. 1: As a mom I am always looking for something that I can chase Hanes in easily but also look fab while doing it. I chose this maxi skirt because I can never pass on a comfortable/chic maxi skirt, and paired it with this oversized cropped sweater for the the perfect fall look. The sweater had the leather detail which is always my favorite, it gives me that edge that I am always looking for. And of course I had to pair it with this cheetah infinity scarf, I mean does it get any better than that? Look No. 2: This tribal cardigan is the perfect piece to throw on while running out the door. You can put it with about anything and look like you have it all together. Which lets be honest, what mom really does?! Look No. 3: The second I walked in Koo De Ker I saw this leather sleeved letterman and new I had to have it. I’m pretty sure when Hanes is ten he’ll think I’m pretty cool for wearing it too. Oh and the black fur vest over top? It’s a must! Look No. 4: Let’s not forget this perfect tan wrap coat! I knew I liked it, but once I put it on I fell in love!! It was the perfect fit and that fall/winter piece that we all need. Not to mention it’s ideal for little Hanes to cuddle with me in. I may finally be the favorite! Cara is a wonderful mom, so dedicated to her little boy, and still manages to look amazing and put together in any situation. Koo De Ker wants us all to have the perfect pieces that make us feel and look like a million bucks, so KDK is making it happen for you! KDK has three $50 giftcards up for grabs for their shop in Salt Lake City! If you’re not local, but you have local loved ones that can shop on your behalf, feel free to enter! We’ll be picking the three lucky winners next week! Leave a comment letting us know which of Cara’s four looks suit your personal style best. For extra entries: like Koo De Ker on Facebook, follow them on Twitter or Instagram @koodeker, tweet, blog or Facebook this giveaway (mention @smallfryblog where applicable so we can see it.) Instagram a picture of your favorite fall ensemble and add the #mumsthreads hashtag. Leave additional comments for each! Good luck, and thank you to Koo De Ker and Cara! We have received some awesome reader submissions for MMT, if you have a Mamattire look to add, email us at hello at smallfryblog dot com. 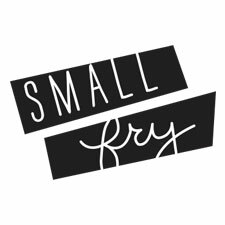 To see the Small Fry mums’ KDK picks head to Small Fry’s Facebook page. I gravitate towards simple. #2 and #4 have my name all over it! What lovely outfits! I LOVE the tribal sweater! And Cara is gorgeous! I wish I looked that good after having my kiddos! Thanks for the great giveaway! I love look #1 or #2! Hope I win! I love the maxi and cropped sweater! Love koo de ker!!! And look number 1 is tops!! Loving the maxi with cropped sweater!! She looks comfy and ready to chase a toddler! It is hard to choose between #1 and #2! The tribal cardigan is so cute and looks easy to pair with just about anything. But that cropped sweater is so unique. Thanks for making such an awesome website, I am loving it. Love the maxi paired with the sweater! really love the tribal cardigan (#2)! ohhh that maxi skirt and chunky sweater. my favorite for sure!! i like them on fb 🙂 fingers crossed! i love love love her first look! im all about maxi’s and love the color combo! following koo de ker on FB! following koo de ker on instagram! Oh that’s so exciting, I’m moving to a small town near Salt Lake on December 1st! I would love to win! I now like Koo De Ker on Facebook! I LOVE look no. 1! I have a slight obsession with maxi skirts and I love the cheetah infinity scarf. The sweater is the perfect color and the leather detail makes it so unique. I need to check out this store! Definitely look number one, but all of the looks are great! Im following @koodeker on insta! I love them all! But I would probably have to choose #2 – I love that sweater! Look number 1 or 2!! But they are all super cute! I love the oversized sweater with the Maxi skirt. I am a mother of 2 and love to play with the latest trends and Koo de Ker is the place to do it!! Congrats you are one of our 3 winners! Email us your address, please! I’m loving #1 and #2. Thanks for the inspiration! I like Koo de ker on Facebook! How did I not know about this shop before? I love look #2 and need that cardigan ASAP! Danielle, you’ve won one of our gift cards, email us your address please! Oh my goodness do I love Koo de Ker! Fabulous giveaway! I absolutely adore the look with the maxi, sweater and scarf – right up my alley! *Fingers and toes crossed!! I like KDK on FB! I also follow KDK on Instagram! I love outfit #1. I am in love with chunky over sized sweaters and leopard print! torn between 1 and 3! love the leather accents on them both, and the fur over the jacket is killer. Love the tribal cardigan and love Koo De Ker. Could absolutey put that gift card to good use. That tribal cardigan and maxi skirt are so adorable! And of course cara looks perfect in all of these looks! This gift card would be a perfect reason to treat myself, as I chase a toddler too! I follow koo de ker on Instagram and like on Facebook. They’re the bomb diggity. Love #2 but all are gorgeous!! I wish #1 was my look, but probably #4 is more it. I love this giveaway! Hoping to win! I love the mauve maxi skirt + mustard sweater. I follow KDK on facebook! You can’t ever go wrong with a maxi skirt and that sweater is beautiful! I love all the looks, but especially #1. 🙂 Koo de Ker has the cutest stuff and Cara styled it just fabulously!! love the long skirt with the sweater ensemble. would be perfect with ankle boots for the fall! I like the sweater and maxi skirt combo best! I totes love the first look, well I really love all of them, but your forcing me to choose. I am a scarf-a-holic and it would fit my style perfectly. Please. Love the sweater and maxi skirt on Cara! look #1 is my favorite!! I love maxi skirts and the sweater is soo cute! Following Koo De Ker on Instagram. Mentioned the giveaway on Facebook. Mentioned the giveaway on Instagram. I love the crop sweater and maxi skirt! So cute!! I love look number three! Ooh – it’s a tough choice but I’d have to say #3. I don’t think I’d ever take that cardigan off! obsessed with the tribal sweater! I love love love the tribal sweater!! I love all these and her amazing hair!! I think my favorite might be the tribal sweater! I love something you call throw on and still look put together! Oh I love the sweater and maxi look, but a close second is the tribal sweater! Love the maxi and mustard sweater! She is gorgeous and Small Fry is fab! I follow kdk on Facebook. I’d be lying if I said I didn’t love the 4th look. A good sweater is always a NEED for the cold weather months. As a mom this is a go-to for me. Congrats you are one of our 3 winner! Email us your address, please! Love the maxi look! And love those two colors together. Loving mustard this fall. Look number 3 is my fav! BTW, holy cow her hair! Someone get that girl to do a hair tutorial quick! smhinckley at yahoo dot come. Her hair is pretty flawless! Check her blog for her hair tutorials, that’s what made her famous. Look No. 1 for sure! Leopard is my black. I love number 2 and 4, I can’t decide between either of them, she is so cute-I love her blog! I love no. 1 !! So cute!! I like (love) Koo De Ker on fb! Look #1 is my favorite!! Love how comfy yet chick it is. Thanks for the giveaway!! Mmmm….it’s a tie between look 2 and 3 for me! Love them all really;)! But I guess I I’d really have to chose it would be no.2! I really love it all but have to say that tribal cardigan is my fav! I love that maxi skirt and sweater combo! It’s not like anything in my wardrobe, but the kind of look I’m starting to move toward. I would love this! We are going to SLC next week for an IKEA trip and some new stylish mom duds would be just perfect! Liked on facebook because I LIKE them! Love look #1 with that chunky sweater! I like Koo De Ker on FB! Look #4! Love all of them though. love the oversized sweater!!! all of them are amazing!!! Ok I love look #1. That sweater is AMAZING. i love look #4! that tan sweater is to die for! I LOVE the cropped sweater and infinity scarf! Look #1 for me. Can’t pass up the Maxi skirts. LOVE THEM. I’m all about comfort with style. Love that letterman’s jacket. So cool and comfy! Style #4 is most like my style! Thank you! I liked Koo De Ker on Facebook! favorite looks are #2 and #4. would love to rock #3 as well. I’m in love with all the looks, especially the maxi skirt! #1! Love it, the maxi skirt is a staple in my closet. I swoon over the sweater and scarf too. 🙂 I liked them on FB even before this post, I LOVE their store! Look no. 1! I love the maxi skirt and sweater.